Bujumbura – The Walias of Ethiopia lost 2-0 to host Burundi in the first leg match of the 2016 Orange African Nations Championship (CHAN) Central-East Zone qualifier. Laurent Mavugo headed both goals for his team with the first one coming just two minutes into the game and the second in injury time. The winner after two legs qualifies for the final tournament fixed for 16 January to 7 February in Rwanda. The Orange African Nations Championship (sometimes referred to as African Championship of Nations or CHAN) is a football tournament which was first announced on 11 September 2007. It is administered by the Confederation of African Football (CAF) and is played between the best national teams of Africa, exclusively featuring players who are active in the national championships and qualified to play in the ongoing season. 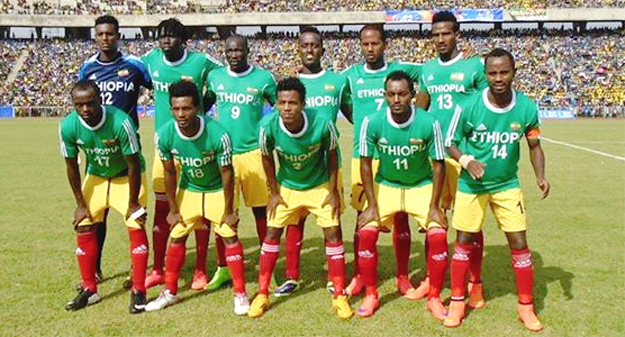 Expatriate players such as Sileshi Bekele (Egypt), Salhadin Said (Algeria) and Getaneh Kebede (South Africa), who play in African leagues do not also qualify to take part in the African Championship of Nations. The tournament is held every two years, alternating with the Africa Cup of Nations. The qualifying phase has taken place every even year and the final every odd year. From now on it has swapped years with Africa Cup of Nations. The first tournament was held in 2009. It was hosted by Côte d’Ivoire and won by The Democratic Republic of the Congo. The competition was expanded to 16 teams for the second tournament, held in Sudan in 2011. The tournament was won by Tunisia, in the wake of the Tunisian Revolution.